In Shangri-La Caf, viagra sale Karen Tam constructs a Chinese restaurant in the Y Gallery. With this construction, Tam hopes to enlighten people by linking the Chinese restaurant to Chinese immigration and history in Canada. Tam is examining the issues and associations many have with Chinese people and how they are often linked with Chinese restaurants. The installation also includes two video works: one featuring interviews with local restaurant owners, and the other featuring her father preparing traditional hybrid dishes. 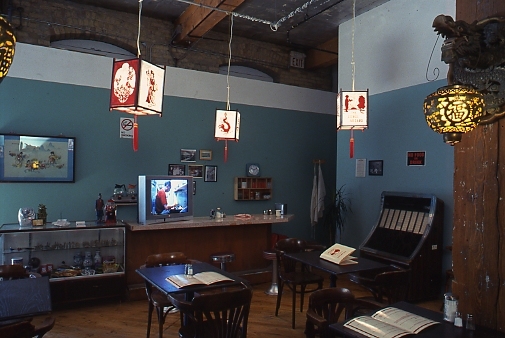 The work reflects Tam’s childhood experience, similar to that of many children in the Chinese community, of growing up in a restaurant environment. This work evokes memories for many members of the Chinese community , as well as customers of these family-owned chop suey restaurants of the past are disappearing. Tam offers a sense of nostalgia, showing honour and respect for the workers who lived through difficult times in order to earn a living. KAREN TAM holds an MFA in sculpture from the School of Art Institute of Chicago as well as a BFA from Concordia University. She has participated in a number of exhibitions and artist residencies across Canada, in Ireland, and in the United States including the MAI (Montreal arts interculturels), Alternator Gallery (Kelowna), Khyber Center for the Arts (Halifax), Expression’s orange event (Saint-Hyacinthe), Irish Museum of Modern Art (Dublin), and Ormeau Baths Gallery (Belfast). Tam has received grants from the Canada Council for the Arts, a masters Fellowship from fonds pour la Formation de Chercheurs et l’Aide a la Recherche, and the Audience Choice Award for her video, Plum Sauce, at Chicago’s Asian American Film Festival in 2002. Tam lives in Montreal.